Welcome to the 2018 Virginia Elite Summer Program! We have an array of programs to offer every age group, every position, every skill level, and every team. Whatever your individual or team training needs are, we offer a training program designed specifically for you!! During these sessions, players will learn the fundamentals of passing and defense. 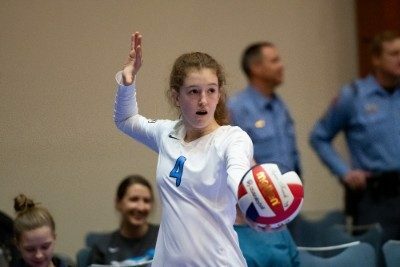 The passing portion will focus on all aspects of receiving serve, including platform control, reading the server, correct footwork/movement, and quality repetitions. 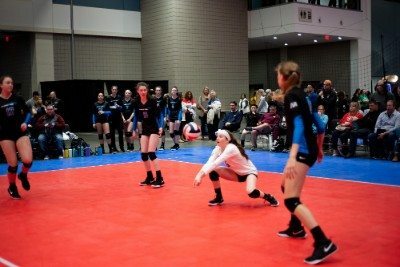 On the defensive side, players will have the opportunity to learn the technical aspects of being a defender, digging a variety of attacks, reading hitters and defensive situations. In addition, players will receive enhanced instruction through instant video and photo sessions with the Virginia Elite Staff. Players electing to attend these sessions will learn the fundamental techniques of hitting. Approach footwork, arm swing mechanics, reading blockers, and reading a set will all be taught and reviewed through many repetitions during the session. Additionally, instruction will be provided for specific hitters such as middle blockers, outside hitters, and right side hitters. 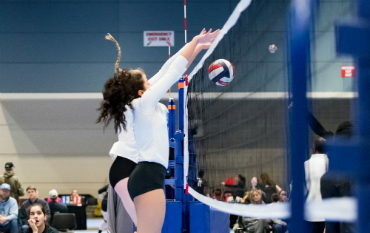 Blocking will also be covered through proper footwork, body position and technique above the net to help athletes develop their blocking skills. In addition, players will receive enhanced instruction through instant video and photo sessions with the Virginia Elite Staff. These sessions are conducted in conjunction as part of our skills sessions for attacking and defense. Over the course of two days, players will learn and enhance their technique through a variety of setting drills focusing on the technical aspects of setting. Players will receive specific instruction on setting technique, hand positioning, and footwork patterns. 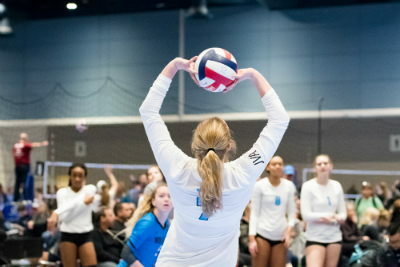 Players will also receive training in advanced setting such as running offenses, decision-making, and the role of a setter inside a team system. In addition, positional hitters will be brought in to work with the setters to provide an opportunity to demonstrate the technique learned throughout the camp as well as learning to set in transition situations. Finally, players will receive enhanced instruction through instant video and photo sessions with the Virginia Elite Staff. There is only one isolated skill in volleyball that you are completely in control of: serving! Our one-hour serving clinics are designed to help any athletes of any level improve the technique and accuracy of their serving. The coaching staff will cover the technical aspects of serve mechanics, along with some tactical and decision-making processes, to develop your serving effectiveness. We will go over three main serve styles which include: standing float, jump float, as well as jump top spin. 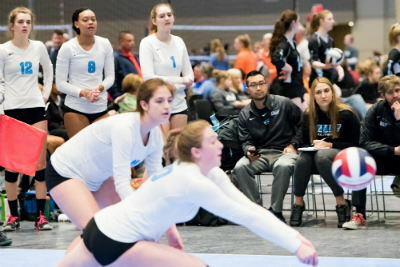 Utilizing various types of feedback and learning cues, athletes are sure to walk away with an increased tactical and technical knowledge of the serving game! The one day Libero and Defensive Specialist clinics will focus on serve receive and defensive techniques. Athletes will be instructed on body position, footwork, movement skills, platform, overhead digging, contact, and other digging techniques. The clinics are open to all high school aged athletes with some knowledge of the fundamentals of ball control and defense. We also welcome all players of other positions searching for improvement of ball control and defensive skills. These positions would include Outside and Middle Hitters interested in improvement backcourt skills to further their proficiencies as a six rotation player. No club affiliation is necessary! Wrapping up our summer program, Virginia Elite is offering High School Prep Sessions for players wishing to fine-tune their skills or simply “shake off the rust” before the start of their high school season. Players will receive a thorough review of all skills and they will have the opportunity to go through MANY repetitions to best prepare themselves for their team tryouts in the following weeks. No club affiliation is necessary and players can attend as an individual or bring their high school teams!! The goals for these sessions are to provide one last opportunity for players to train before they transition to their high school season. In addition, players will receive enhanced instruction through instant video and photo sessions with the Virginia Elite Staff. New for the 2018 Summer offerings, we are excited to add our College Prep Sessions for players wishing to fine-tune their skills or get more reps before they head off to their respective collegiate programs. Players will be instructed by Jason Kozak, a 16 year veteran of collegiate coaching, who will provide an advanced/intermediate level environment focused on high repetition, fast paced drills. No club affiliation is necessary and this program is also open to advanced level high school athletes as well. Due to the popularity of our summer program space is limited and we are only accepting online registrations. We look forward to seeing you in the gym this Summer! Does the cost of the Defense & Passing, Attacking & Blocking and Setting clinics include both days? Yes, the price of the clinic is for all training hours. Why are Setting clinics more expensive than Defense & Passing and Attacking & Blocking? The setting clinic runs simultaneously with the Defense & Passing and Attacking & Blocking clinics but while those clinics are 1.5 hours per day, setting is the full 3 hours for a total of 6 training hours over 2 days. The setting clinics are capped at half the number of participants due to the technical nature of the position and the coach-to-athlete ratio we provide during our training time. Do the HS Prep Session build off of each other or can my athlete attend just one session or a few but not in order? The HS Prep Session are designed to be a high rep, fast paced clinic where athletes can get ready for their impending HS tryouts. The HS Prep sessions will all be different, so no 2 are going to be repetitive but they do not build off of each other. Athletes are encouraged to attend as many as they would like and in any order.